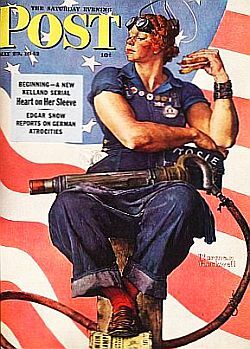 “Rosie the Riveter,” shown here in a Norman Rockwell ‘Saturday Evening Post’ cover of 1943, has become a popular “we-can-do-it” story. The Pop History Dig is a magazine-styled website about contemporary culture and popular history. One goal of the site is to use the visibility of popular culture – its music, its film, its literature, and its famous personalities – to engage readers on topics ranging from civil rights history to the power of the entertainment industry. Stories on popular music and Hollywood celebrities are found here, but so are those on presidential campaigns, Madison Avenue advertising, and big business mergers. More than 250 stories are now offered, often looking at some mix of issues such as: politics and music, technology and business, Hollywood and politics, media and culture, sports stars and advertising, and other such pairings. Stories on environmental history are also offered at this website, typically focusing on the pollution and public safety records of major companies in the oil, chemical, coal, and auto sectors. Some stories on business and public policy are serious and detailed, while others on music, film, and sport offer lighter fare. But the intent in every case is to inform with engaging profiles backed by reliable sources. PopHistoryDig stories have been cited by a variety of news organizations and websites, among them: CNBC .com, Forbes.com, The Los Angeles Times, MSNBC.com, The New York Times, Salon.com, The Washington Post, and others. Schools, colleges, and universities cite and/or link to PopHistoryDig stories for course work and reference, as do various scholastic, educational reference, museum, and history-based organizations. Among some of these have been, for example, H-Net.org, History Net.com, SocialStudies.com, and SmithsonianMag.com. Government agencies and corporations, U.S. House and Senate offices, business trade associations, the Library of Congress, and the National Archives have also visited or linked to PopHistoryDig stories. In addition, numerous blogs, independent websites, and users of social media regularly list or link to PopHistoryDig stories, including those at Facebook, Pinterest.com, Reddit.com, Tumbler, Twitter, YouTube, and others. Wikipedia entries have included Pop HistoryDig citations and story links, while search results on Google and other search engines – given reasonably relevant queries – typically yield first- or second-page listings. 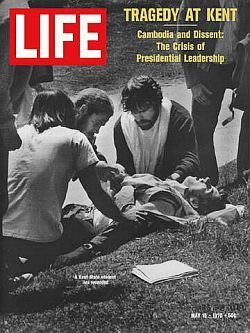 The shooting of students at Kent State University in May 1970 is part of a story about a Vietnam War era protest song. Click for story. Story choices at The Pop History Dig range across music, film, sports, politics, advertising and business. Bob Dylan and Billie Holiday have stories here that cover their music, but also civil rights history. Norman Rockwell’s art for the Saturday Evening Post and Look magazines is the subject of two stories here, one of which also focuses on civil rights. Hillary Clinton, Ronald Reagan, Bob Dole, and Sarah Palin are mentioned in stories about pop music and political campaigns. Sandy Koufax, the 1960s’ Los Angeles Dodgers’ baseball star, is featured in a story about his historic feat of winning three Triple Crowns for pitching. These stories and others vary in length, but most are longer than a typical blog. They usually seek to cover new ground or offer new takes on older stories. Most are also visually rich with photos, sidebars, and other graphics, hoping to engage readers on several levels. Some contain music or video files, while others link to YouTube or other video and music sites. The intention, in any case, is to inform and educate, and also probe the influence of culture on daily life. The power of magazine cover art is among topics at this website. 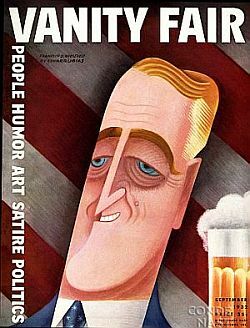 FDR shown on a 1932 Vanity Fair cover. A number of PopHistoryDig stories have substantial biographical content, as in the profiles of Bill Bradley, Janis Joplin, Barbra Streisand, Taylor Swift, Tina Turner, and The Ronettes, for example. Others delve into the political personality and its impact on society, as in at least three stories here involving Richard Nixon. Other stories focus on technology, as in the rise of the Apple Computer Company in 1976-1985 period, or how the arrival of talking motion pictures upset the status quo of the silent film establishment in late 1920s Hollywood. The use of celebrities in advertising is also a category covered here with several stories, some focusing on tobacco ads featuring movie stars like Al Jolson and John Wayne, or notable athletes such as baseball’s Babe Ruth, 1930s tennis star, Ellsworth Vines, and New York Giants football halfback, Frank Gifford. Books and publishing are part of the beat here as well; not only how best-sellers such as John Steinbeck’s The Grapes of Wrath become historically and socially significant, but also how other books like Love Story or The Bridges of Madison County have led to gigantic box office showings as Hollywood films – and in these cases, how the books also provoked debate over literary value. Other books, such as Rachel Carson’s Silent Spring of 1962, are covered for how they changed public opinion and public policy. 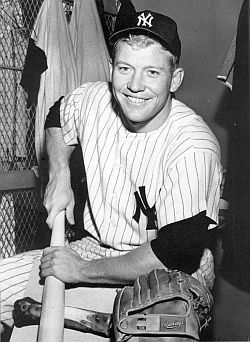 Mickey Mantle, the 1950s-1960s New York Yankee legend, has a few stories here, too. One story here about the rise of C-SPAN, the public affairs cable TV network that covers Congress, not only lays out C-SPAN’s history, but also how that network has provided an amazing range of public affairs programming, not least of which are its “Book TV” offerings and guest interview programs such as Q&A. On a lighter turn, Mickey Mantle’s home runs are covered here, and so is Madonna’s music– the latter in connection with a 1980s Pepsi advertising campaign. Lady Gaga has a story here as well, focused on a TV ad she did for Google. That story is as much about Google’s growing media power as it is Lady Gaga. 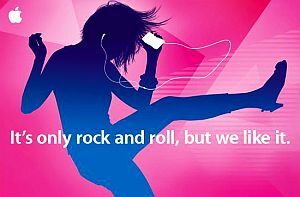 A long story on Apple’s very successful “dancing silhouettes” advertising campaign for its iPod music player is a story about technology, but also the power of music, image, and cultural hipness. It is also a story about bottom-line business success, soaring iPod sales, and how the cultural elements in an integrated global advertising campaign helped send one company to the very top of the Global 100. There are media histories here as well – one of Ted Tuner’s CNN, another touching on part of Rupert Murdoch’s empire, and a third on the rise of ESPN, the “all-sports” cable TV network. Billionaire Warren Buffett has a story here too – on how he attained a kind of mainstream celebrity which he later used to good ends. And there are lots of other stories – on the music of the 1960s, baseball history, Vanity Fair political art in the 1930s, the rise and power of the Beatles, and many more. 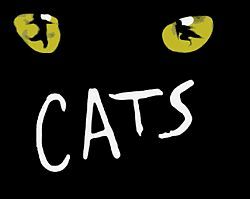 The story of “Cats,” the successful stage play and film of the 1980s and beyond, is told here through the song “Memory” with Grizabella. To choose a story, simply go to the Home Page, or any of its extensions, and click on a thumbnail photograph or live-linked story title, to go to that story. Category pages, listed on the navigation bar in the upper left-hand corner of the site, offer similar thumbnail descriptions and links to stories in “Music,” Politics,” “Publishing,” and other categories. There are also various “topics pages” at the site – i.e., “Athletes Advertising,” Beatles History, “Baseball Stories,” Civil Rights, Democrats’ History, “Noteworthy Ladies,” Environmental History, Kennedy History, Magazine History, Republican History, “Sinatra Stories,” and others. These pages, with thumbnails and live links, offer further groupings of stories with related content. A period archive in the upper right hand corner lists stories by decade, each with brief descriptions and live links. At the end of every story, there is a separate section entitled “Sources, Links & Additional Informa- tion,” which includes the story’s sources, related links, additional information and often extra photographs related to the story. 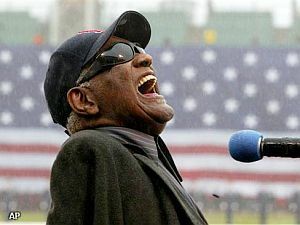 Ray Charles performing “America the Beautiful,” the subject of a story focusing on Charles’ interpretation of the song & use in advertising & politics. Click for story. Donations from individuals, businesses, foundations, and other institutions to support the work of this website are welcomed and encouraged. All such support will be used to sustain and support the site’s operations and to help pay for research, writing, composition, and editing of all stories and also for site upgrades and technical support. To make a donation please go to the “Donate” option via the upper left navigation bar, or click on “Donate Now” in the small blue-gray “Donate” boxes that appear at the end of each story. All questions regarding financial support for this website can be directed to Jack Doyle at jdoyle@ pophistorydig.com. Technology, art & music are the subjects of a story on Apple's "dancing silhouettes" iPod advertising campaign. Currently, The Pop History Dig uses Google’s AdSense advertising program and Amazon’s Associates program in an effort to financially support the site’s operations. No pop-up adds are used or accepted. Businesses and individuals with interest in possible sponsorship, funding, and/or advertising can contact Jack Doyle at: jdoyle@pop historydig.com. A custom research service is also offered by The Pop History Dig on subjects related to the topical material covered at the website. Under contract arrangement, research projects and/or consulting services can be specifically-tailored to meet the needs of outside clients. The Pop History Dig is also open to collaborations, joint projects, and affiliations with colleges, museums, foundations, non-profits, and/or news organizations. Please contact Jack Doyle with proposals, queries, or suggestions. The music of the Beatles is covered here, but so is their larger impact on culture & the music industry. 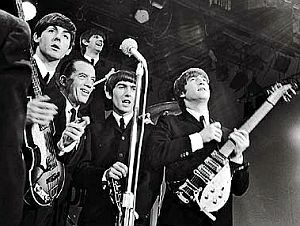 Shown w/Ed Sullivan, 1964. Click for stories. The primary purpose of The Pop History Dig website is public education. Short stories on the history of popular culture and related subjects in the media and entertainment industries are presented at the site to inform interested readers and the general public. These stories are offered to further public understanding of history, culture, and current affairs. In order to fully describe and present the central point, argument, and/or criticism in each story, various literary, artistic, photographic, and/or electronic works under copyright may be cited, referenced, quoted, and/or shown in whole or part. A story on Ted Turner & CNN is included at this website. 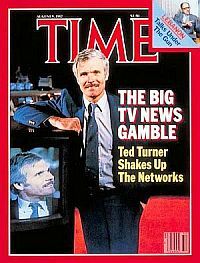 He is shown here on Time's cover, August 1982. It is believed that the use of these and other similar materials in the posted stories constitutes “fair use” under U.S. copyright law, as it is the intention of The Pop History Dig only to use such materials for general identification, public education, critical commentary, and other purposes associated with a journalistic and public education undertaking. The images of events, products, and individuals shown at this website are the property of the artists or other entities shown, cited, and/or mentioned in the posted stories. The Pop History Dig disclaims any ownership or other interest in these images, names, brands, or products. Full citations are offered at the end of each posted story for all materials and works relied upon, as well as additional bibliographic referrals and appropriate internet links. All sources cited throughout this website are believed to be reliable and accurate. Links to targeted topics and/or videos related to story subjects are included for the convenience of the reader and will take the reader to external websites. These links are intended to focus only on the targeted subject matter related to the story at hand and not to other material or videos that may appear on linked websites. Jack Doyle is the founder, publisher and sole proprietor of this website. He is a former public policy analyst and lobbyist who worked with Washington, D.C.-based environmental organizations for more than 20 years. He has also published several books, including: Taken For A Ride (auto industry), Crude Awakening (oil industry), Trespass Against Us (chemical industry), Lines Across The Land (rural electric co-ops) and Altered Harvest (agricultural biotechnology). His writing has appeared in the New York Times, Washington Post, Boston Globe, Pittsburgh Post-Gazette, San Francisco Chronicle and other publications. Much of his work has been investigative, typically focusing on energy and environmental issues, business history, and public policy. He has also served as a consultant to public agencies and private-sector clients, spoken before university and trade group audiences, and appeared occasionally on radio and TV programs. In recent years, Doyle’s research interests have included the media and entertainment industries and their impact on business, culture, and politics. In addition to his research and writing at this website, he continues to work as a consultant, research analyst, and contract writer and is available for hire. Interested parties can contact him directly at: jackdoyle47@gmail.com. Thanks for visiting — and if you like what you find here please make a donation to help support the research and writing at this website. Thank you.